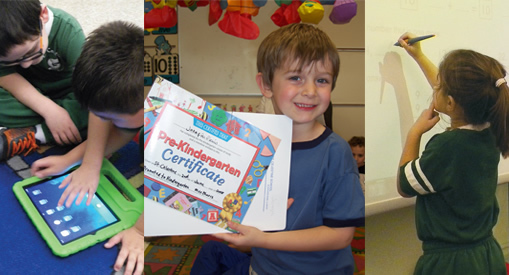 Our preschool classes are a wonderful way for your child to begin their educational journey. St. Celestine School offers several Preschool options to choose from. 3 year half day Preschool, two days a week, Tuesday and Thursday mornings. 4 year half day Preschool, three days a week, Monday, Wednesday and Friday mornings. 3 and 4 year half day Preschool, five days a week, Monday through Friday afternoons. 4 year All Day Preschool, five days a week 7:50 am – 3:05 pm. Before Care ($2/hr) and After Care ($3/hr) is an added benefit to our Preschool programs. We focus on the well-being of the child and their social, emotional, and physical abilities. Curriculum for preschool includes the following subject areas: art, emerging language, reading, and math skills, music, physical education, religion, and technology at the appropriate Preschool levels.